One of the core objectives of OPTi is to study and model a DHC system and its operations from the consumers’ and economic viewpoints. This will involve, as a main outcome, the development of consumer and economic modelling components of the OPTi simulation framework. It will also involve a socioeconomic sustainability analysis of the overall OPTi system. A short description of these two components of the OPTi framework and their functionality is presented below. Understanding and modelling consumer comfort/discomfort which drives the above preferences. 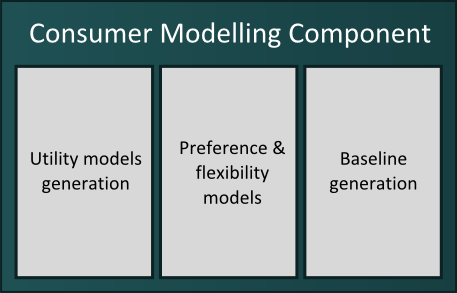 A key objective associated with modelling consumer preferences is to model the energy consumption/demand of the consumer. This is also known as baseline consumption modelling. In OPTi, we plan to use a context vector based approach for modelling the baseline, wherein we identify appropriate contextual variables (such as time of day, day of week, season, outside temperature, etc.) that explain the historical consumption recorded for the consumer in question. Another aspect of modelling consumer preferences is to understand a consumer’s indoor temperature preferences. In OPTi, we plan to use a “virtual knob” to obtain feedback from the consumer on whether or not he/she is comfortable with a certain level of indoor temperature. Statistical analysis on the data obtained via the virtual knob, which entails categorization of the data based on context combinations, shall then be used to mine the consumer’s temperature preferences. Modelling a consumer’s comfort/discomfort is a challenging task because of it being an abstract quantity, which is difficult to quantify numerically. In literature, the concept of utility functions is often used to quantify the benefit derived by the end consumer of a service (e.g. electricity). In OPTi, we plan to extend the concept of utility functions to model a consumer’s thermal comfort via a novel hybrid approach which combines theoretical utility functions in literature with statistical analysis of data obtained from the virtual knob. The outputs of the consumer modelling component will be (i) baseline consumptions, (ii) indoor temperature preferences and (iii) comfort/discomfort models for a consumer. Through these outputs, the consumer modelling component interacts with the economic modelling, physical modelling and optimisation and control components of the OPTi framework. The Economic Modelling Component, with its underlying functionality will take into account the economic parameters/characteristics of the various stakeholders participating in the OPTi DHC environment, their motivations, incentives and relationships among them and will attempt to optimise them (from the economic perspective). In particular, it will contribute to methodologies and optimisation algorithms for the complete design and definition of simulated DR and ADR enabled programs and their underlying control strategies that will be compiled within contracts tailored to each consumer’s needs. Although the literature related to DR programs is quite extensive, OPTi aims to adopt control strategies and methodologies that are in line with the DHC environment’s peculiarities and the stakeholder’s needs and preferences. Different energy generation technologies will be considered within the ambit of economic modelling, that shall be driven both by the use cases referring to the real trials and the ones to be simulated. Moreover, the various contracts will be specified and parameterised following each consumer’s preferences and choices as defined in the Consumer Modelling Component, including also various pricing schemes, opt-in and opt-out options, penalties, etc. A key element of this component, which is also inextricably linked with the ADR definition and contract design, refers to the determination of the various incentive mechanisms and associated targeting policies, i.e. the algorithms that enable the selection of an optimal set of consumers to be targeted for DR and the policies that minimise the discomfort caused to consumers, while at the same time minimising the incentives offered by the provider. Particular emphasis shall be placed on development of innovative approaches towards the estimation of the value of the incentives that should be offered to each targeted consumer. In this regard, concepts from behavioural economics shall be invoked to yield improved predictions of the behaviour of users and better policy prescriptions. 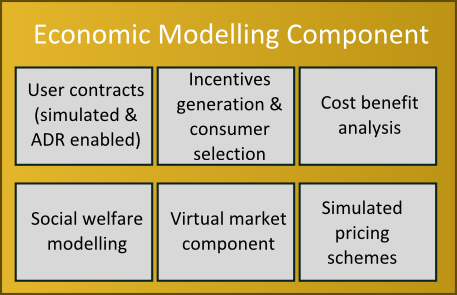 By exploiting the consumer utility functions defined by the Consumer Modelling Component and taking into account the objectives and technical restrictions of the supply side, the Economic Modelling component will deliver the respective models that will enable an appropriate realisation of the notion of the social welfare and the definition of the economic optimisation problems to be analysed in the Optimisation and Control Component. The outputs of this component will be (i) user contracts, which in turn will enable (ii) optimisation mechanisms for the ADR programs and (iii) the incentive and targeting policies for these ADR programs. These outputs will be made available to the Optimisation and Control Component of the OPTi framework, in order to be utilised during the execution of the ADR programs either in the real trials or in the simulations. The project has received funding from the Horizon 2020 Research Programme of the European Commission under the grant number 649796.